Located on Milton Road accessible from Babbitt Road. The Babbitt Fields are home to the House League U10, U8, U6, and pre-k divisions. 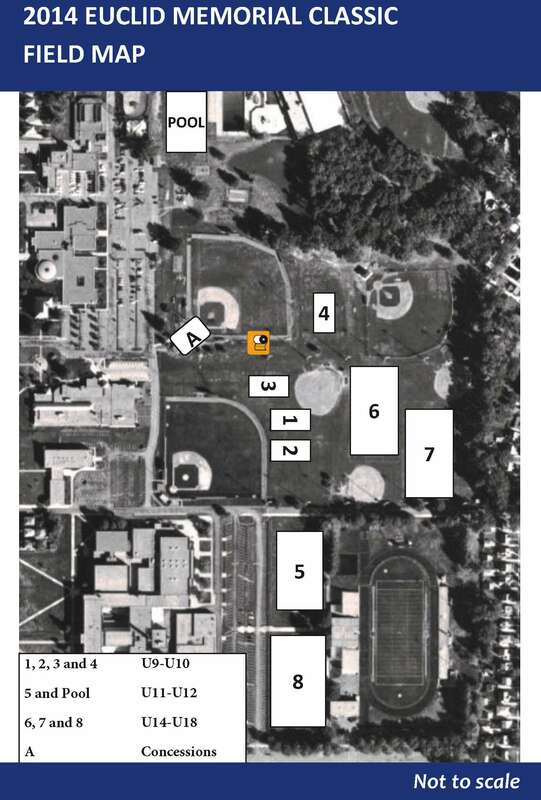 Multiple fields are layed out at Babbitt. Located on Milton Road accessible from East 222nd Street. The Pool Field is used for U12 (travel and rec). Located in Euclid's memorial park, the Pony field is situated between baseball diamonds and is easiest to access from the parking lot behind city hall off of East 222nd Street. The pony field is used for U12 and U14 practices. Accessible from Shore Center Drive behind Burlington Coat Factory. Shore Field is used for U14 travel, and U15 rec. Shore field is to be used only by permission from the Euclid Board of Education. On the campus of Euclid High School. The high school turf fields are used for U14 travel, and U15 rec. Fields are to be used only by permission from the Euclid Board of Education. Located in Euclid Memorial Park near the Library and Euclid High School. Accessible from East 222nd Street, or from Milton Avenue. The Tournament Fields are set up only for the Euclid Memorial Classic Tournament each spring. The field map is below and a printable version is available here. Look for the big Eastlake Soccer sign along Lake Shore Blvd. 13 minutes from downtown Euclid. Off of Chardon road behind the Kirtland Senior Center. 17 minutes from downtown Euclid. Behind Kirtland High School. Enter south of the football stadium and follow the road all the way back to the Rec Park. The soccer fields are beyond the baseball diamonds. 15 minutes from downtown Euclid. Fields are just east of the school. 38 minutes from downtown Euclid. Behind the senior center. Easier parking is available along Talmadge Ave.
7 minutes from downtown Euclid. 10 minutes from downtown Euclid. Fields are east of the store with parking just adjacent to the field. Additional parking is available off of Wilson Mills Road. 21 minutes from downtown Euclid. U14 field is closest to the parking lot. U12 field is north of the parking lot. An additional field is further down past the pavilion. 27 minutes from downtown Euclid. 16 minutes from downtown Euclid. 11 minutes from downtown Euclid.